It's the time of the year again! PRIMA AVENUE @ Cyberjaya, with the support of Old Town White Coffee @Cyberjaya, Where Else Delights Restaurant, Kitchen Village Restaurant and Padi House Restaurant, is proud to announce that the much anticipated Prima Avenue Sports Tournaments are just around the corner, ready than ever to crown the next ultimate champions. The respective winners will not only be assured of lucrative and irresistible prizes, but also the ever so priceless bragging rights! So put on your team's jerseys and come on over to join us at the Prima Avenue's Sports & Recreation Area. 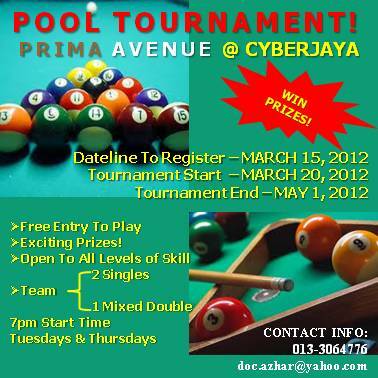 Both tournaments which will run concurrently from Monday 19th MARCH to 1st MAY 2012, are OPEN for ALL. 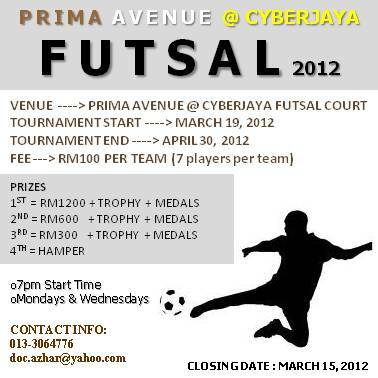 The Futsal Tournament will run on Mondays & Wednesdays, while the Pool Tournament will run on Tuesdays and Thursdays. Those who are interested will be accepted on a first come first serve basis since we are limiting both tournaments to only 24 teams. Matches will be scheduled to start after 7:00pm. Very attractive prizes await the winners, runners-up, 3rd and 4th placed teams. For Futsal, an entry fee of RM100 per team will be imposed to to ensure full participation from each team as walkovers will no longer be an option. This entry fee is payable before balloting day (on Friday, March 16th at 6pm at Where Else Delights Cafe). Dr. Azhar might throws in team jerseys if he gets enough teams participating in the tournament. For Pool, there will be a RM50 deposit which will be returned (in the form of meal vouchers) in full if your team does not give walkovers. If you are interested to join in the fun, the Team Registration Forms are available for you to download (download links below). Fill them up and return to us via email (the event manager) by 6pm, Thursday, March 15th., 2012.